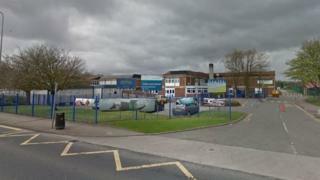 A headteacher is facing a backlash from parents after unisex toilets were introduced at a secondary school. Little Lever School in Bolton has installed male and female cubicles in the same bathroom for the new term. Several parents shared concerns about a lack of privacy on Facebook, with some threatening to keep children at home. Head teacher Dominic McKeon said full-length doors ensured the cubicles were private, and said he would "listen to the views of parents". Photographs on the school's Facebook page showed a row of male and female cubicles on either of the room, with shared basins. One parent said: "Some girls would find it embarrassing or difficult to deal with. I know I would have done." In another unpopular change at the school, lunch breaks were cut to 30 minutes for the start of the school year. Some parents said their children had not had time to eat during the school day. Mr McKeon responded to parents' concerns, stating: "The toilets go from the floor to the ceiling to create a private cubicle." He told the BBC feedback from pupils had been "mixed" and a final decision on the toilets would be made at a meeting of governors on 12 September. "Younger pupils seem to be quite comfortable with using the toilet, but some of the older pupils, particularly girls, have raised concerns and we are listening to them," he said. "This was a solution to there being no toilets in that part of the school," he continued. "We have options to change the arrangement and the school's governors will make a decision on that next week."